Bessie Bray stood on the sea wall leaning against the whitewashed lighthouse. The sun was rising behind her back as she waved goodbye to her papa, Robert. He sailed out of the harbor in his fishing boat heading towards the Firth of Forth. He was dressed in his creamy-colored, wool, Arran sweater. His cocoa brown hair was plastered against his head from the spray of the sea as the boat plunged into the waves. "Cheerio, Papa," she called to him, waving her hands frantically. When his boat was no longer in sight, she walked cautiously along the narrow sea wall until she was safely back on the dock. The aroma from the fish market sat heavily in the air and in a few hours, after the return of the many fishing boats, it would be even worse. Mackerel, cod, haddock, oysters and many more treasures from the sea, would soon be spilling across the cold stone floors of the fish market. People were already busy, stacking boxes of ice for the fish to be placed in. Soon the building would be buzzing with men and women coming to get the freshest fish. Bessie turned and walked up the steep hill towards Main Street. She climbed the steep wooden stairs and went into her house. "Mum, I’m home. Papa is on his way. I hope he brings a load of fish home tonight," she called. 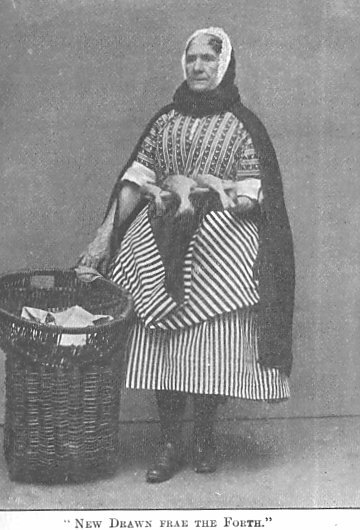 Her mum, Christina, was dressing in her fisher-wife clothes. When the boats came in, she’d be allowed the first selection of the fish from her husband’s boat. She’d fill her creel and wander the streets calling, "Who’ll buy my herring?" "I’ll need you to watch the wee ones when your Papa comes back, lass. I’ve got to sell some fish today," her mum said. "Yes, Mum. I know," she sighed, looking at her younger brothers, Liston and Noble. "Mum? When will I be able to sell fish? I want a costume like yours. It’s colorful, Mum, with the dark blue and yellow and white stripes. You look like a yellow butterfly, Mum." "Oh, Bessie, don’t hurry into it. It’s hard work. The creel is heavy. Why, if I didn’t have all those layers on my dress to help hold it, my back would be broken by now. Enjoy being young child," her mum urged. As the afternoon came, the fishing boats arrived back into the harbor. "I’m off, lass. Thank you for your help. I’ll bring home a big bit of haddock for us tonight." Her Mum kissed her on the cheek, grabbed her creel and headed down to the harbor. Jumping off the boat, Robert started filling boxes with the fish he’d caught that morning. Seagulls flew above, hovering, waiting for an opportunity to steal a fish. Christina wandered up to him. "Any luck today, Robert?" she asked. Robert looked up at his wife. Her hair was pulled back into a bun and her complexion ruddy and weather-beaten. "Aye. Got a full catch this morning," he replied. "I’ll take some then for my creel and be off. I can finish wee Liston’s jumper as I walk," she said, pulling the knitting needles, wool, and half finished jumper from a fold in her outfit. She bent over and selected a few large herring, some haddock and cod. "See you at home, Robert," she said and walked away. Without further delay, Robert filled the crates with fish. Christina walked the streets for four hours, calling, "Who’ll buy my fish? Who’ll buy my herring?" She’d go from door to door selling, or stand on the street corners. After selling all but one haddock, she headed home. It was dark. Robert was home, busy playing with the wee ladies. Bessie was peeling potatoes and onions. Christina put the fish on the table and quickly filleted it. She washed her hands and gave the boys and Bessie a big hug. "Who wants haddock?" she asked. "Thank you for peeling the tatties, Bessie. We’ll have a feast tonight." She and Bessie prepared the meal and the family sat down. "Since its Sunday tomorrow, the other fisher-wives and I will be putting on a performance down at the town hall. Will you come and hear us sing?" she asked her family as the food was passed around the table. "I’ll come, Mum," assured Bessie. "I want to sing with the Yellow Butterflies when I’m big enough." "I’ll come too, Mum," said Noble. "I like to hear you sing. "Me come," chuckled wee Liston. "Well that does it. Everyone will come. You will too, won’t you Robert?" she asked her husband. "Of course. I wouldn’t miss it. We’ll all be there," he said. That night they sang songs and then the wee ones went to bed. Christina stayed up and finished knitting wee Liston’s jumper. It was brown with a Fair Isle design of tan and white woven through it. Robert read a book and smoked his pipe. The next day the family dressed in their Sunday best and headed to the town hall. The whole stage was covered with women all dressed in their clean fisher-wife costumes. They sang songs for their families and neighbors. The children sat quietly and listened to their mothers. It was a grand performance. When they were finished and it was time to go home, rain began pouring down. Everyone ran to their houses. "It’ll be a bad morning for fishing tomorrow," Christina said. "The sea’s rough and the wind is howling, Robert. Will you no stay home tomorrow?" she begged. "You know I have to go out, no matter what the weather. We’ve got a family to take care of. I’ve seen worse weather. I’ll be fine," he assured his wife. The wind blew all night. The rain poured down on the village. The next morning, when Bessie got up, she found her mum in the kitchen crying. "What’s the matter, Mum?" she asked. "Your Papa had to go out on the boat. The Firth of Forth is horribly rough. Imagine the North Sea? I’m just worried lass," she cried. "Oh, Mum. Papa’s been out in this many times before. He’ll be fine," she calmly whispered. "Papa’s a great seaman. So are all the other men in the village. They’ll all come back safely, Mum. Don’t worry." Christina looked at her daughter and smiled. "Yes, he will. Now, I need your help bathing the lads." They spent the day cleaning the house and baking scones and bannocks. In the afternoon Christina bundled the wee ones up in heavy jumpers and rubber boots and they walked down to the harbor. Just as they reached it, the clouds broke and the rain stopped. "There’s Papa’s boat," called Noble. Christina sighed with relief. "I told you he’d be fine," Bessie assured her. "I’ve been thinking," Christina said, taking Bessie’s hand, "it’s about time for you to get your Yellow Butterfly costume and join us. I hadn’t realized what a big lass you’re getting to be." She squeezed her daughter’s hand. When Robert came off the boat, Bessie ran up to him, excited and happy. "I’m a Yellow Butterfly now, Papa. Mum’s making me a costume, just like hers and I get to help her sell fish too." Robert smiled and hugged his daughter. "I’m proud of you, lass. Will you help me with the fish?" he asked. As the family worked unloading the fish, the sun came out. A rainbow spilled across the sky, shining with reds, blues, greens, purples, oranges, and yellow. It turned out to be a wonderful day after all.